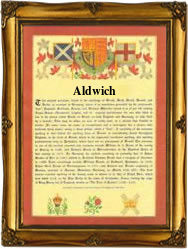 Recorded as Alderwick, Aldwich, and Aldwick, this is apparently an English surname. It is clearly locational and originates either from the district known as Aldwich in the city of London, Aldwick, a village in the county of Sussex, or perhaps from some now 'lost' medieval village. The name means 'The old (dairy) farm' from the pre 6th century 'aeld - wic'. The suffix 'wic' occurs regularly in English placenames, and generally implies a dairy farm of some sort. Gatwick for instance means 'The goat farm', which some might consider appropriate with the building of an international airport on the site, whilst Cheswick, describes a cheese farm. Locational surnames were amongst the first to be created. They were often given to the original lord of the manor, but from the medieval times onwards they became surnames that were given as easy identification, to former inhabitants who moved somewhere else, often the city of London. Spelling over the centuries being at best erratic and local accents, very thick, lead to the development of 'sounds like' spellings. Early examples of surviving recordings from the registers of the city of London include Peter Aldwicke who married Jane Barendine at the church of St Lawrence Jewry, on December 14th 1606, whilst Robert Alderwick and his wife Elinor, were christening witnesses at the church of St Dunstans in the East, Stepney, on July 22nd 1716.